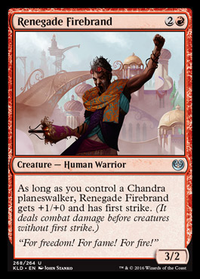 Can I tap Chandra, Fire of Kaladesh after first strike damage is applied? 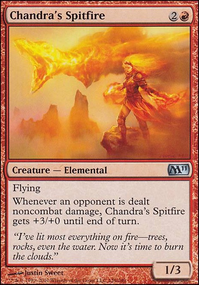 Flipping Chandra after she "dies" in combat? 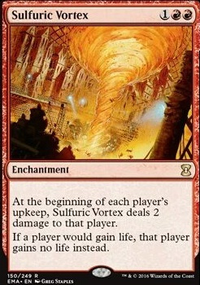 What color are multi-colored cards considered? 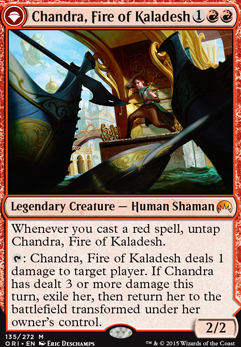 Chandra, Fire of Kaladesh deals 1 damage to target player. 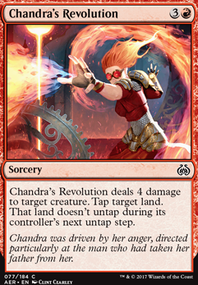 If Chandra has dealt 3 or more damage this turn, exile her, then return her to the battlefield transformed under her owner's control. 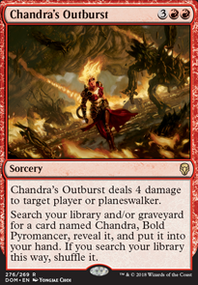 Chandra, Fire of Kaladesh Flip seems to be working in comments though. 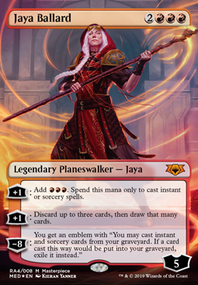 Updated artwork with higher resolution, in the (000) promo set. My alters aren't showing on my decks after I try to add them. 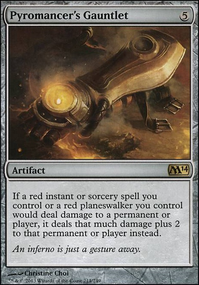 It seems to automatically change the "=" to a ": ", which I think (though I'm not certain) could be why the alters aren't showing up after saving a deck. 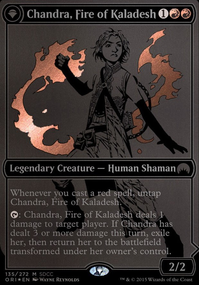 Related, the Chandra, Fire of Kaladesh promo set card's image (the SDCC 2015 one), and it's other side, are really low quality, which is the reason I tried to do an alter to get a nicer image. It would be awesome if it could be updated to a better picture? Activated and triggered abilities on the stack exist independently of their source. The ability will do as much as it can when it resolves. 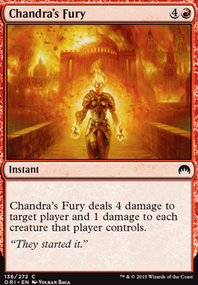 It can still deal damage even if the Chandra, Fire of Kaladesh Flip it came from is no longer on the battlefield. 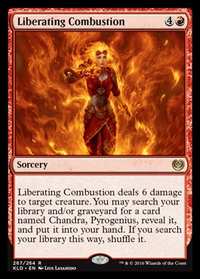 It just won't be able to transform Chandra. 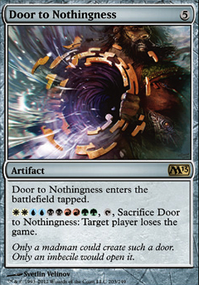 Hey, interesting concept for a deck. Willbreaker : gain control of your opponents creatures by pinging them. 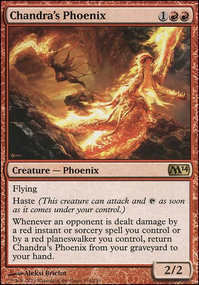 Niv-Mizzet, Parun : combos with Curiosity/Sense/Eye to do infinite damage. 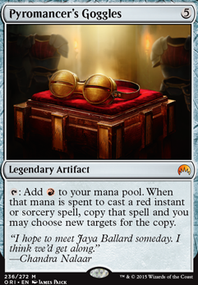 Mystic Remora : excellent repeatable draw in multiplayer Commander. 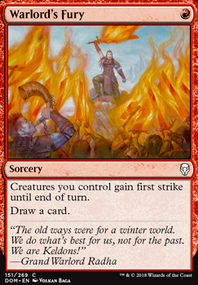 Nin, the Pain Artist : ping your own creature for a lot of damage and draw a lot of cards combos with Doll. Fervor : give pingers haste. 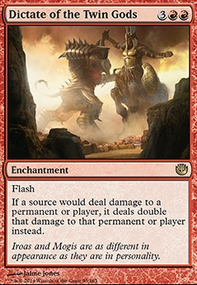 Skullclamp : lots of 1 toughness creatures here makes Clamp good backup draw. Trinket Mage : tutor for one of Collar/Head/Ring/Skullclamp. 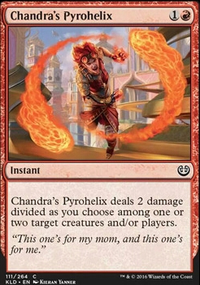 Yup, Chandra, Fire of Kaladesh Flip worked well, thanks again! 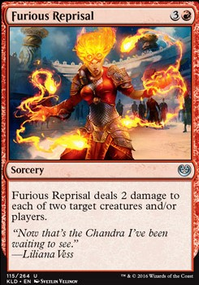 At the beginning of each end step, if you gained 4 or more life this turn, exile Ajani, Rejected and return it to the battlefield transformed. +2: Create two 1/1 white cat warrior creature tokens with lifelink. 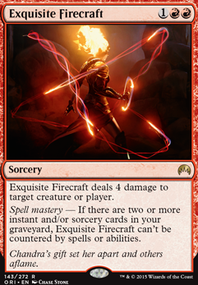 -4: Destroy target creature with power 4 or greater or with toughness 4 or less. 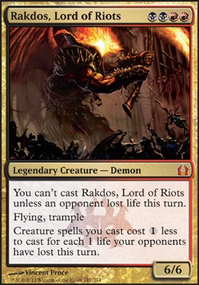 -8: Double your life total, then create that many 1/1 white cat warrior creature tokens with lifelink. I just made Ajani's pre-walker and flip-walker. Design another flip-walker.